"He reasons ill who tells that Vaisnavas die, when thou art living still in sound. The Vaishnavas die to live and living try to spread the holy name around." This is the way you will see the verse throughout the internet and printed in contemporary books also. "The Vaisnavas die to live and living try to spread a holy life around." Of course, one may think that to say, “…to spread the holy name around” sounds better, but that raises the question, “Who are we to change the words of Bhaktivinoda Thakura?” Keep in mind, this is not a matter of translation. 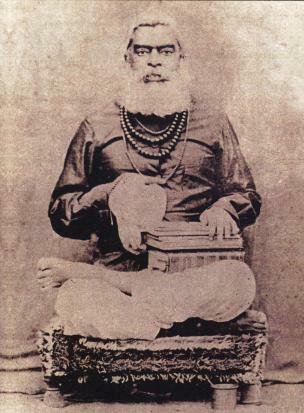 Bhaktivinoda wrote the poem in English. It seems that the conditioned souls of this world are infected with the disease of ‘change’ – addicted to changing everything—change, change, change! In fact, in the present day, the disciples of Srila Prabhupada who are in charge of the Bhaktivedanta Book Trust (BBT) have made more than 7,000 changes to Prabhupada’s original books. One may argue that those changes were simply to improve the language, but sadly, while trying to ‘improve’ Prabhupada’s use of the English language, a significant number of those changes have philosophically altered the meaning of what Srila Prabhupada had originally written. Among other things, the siddhanta has been changed to fit the narrative of ‘society consciousness’ rather than that of Krsna consciousness. At present, devotees worldwide are very disturbed by the changes to Srila Prabhupada’s original books and they have every right to be so. 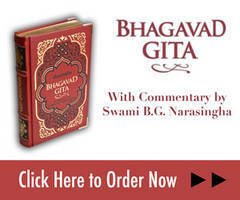 They are now fighting in the courts regarding the changes in Prabhupada’s books. Unfortunately, they never stop to think how much this affair displeases Srila Prabhupada. It is shameful, it is an abomination! Srila Prabhupada: You cannot make any changes in my spiritual masters book. Govinda Dasi: What about the incorrect grammar? So let this be a warning to devotees everywhere. That which our Guardians have given us will deliver us from samsara, the cycle of birth and death. Therefore, we should not be over-intelligent and change their teachings, thinking that we know better. Such arrogance and pride should never arise in the heart of a pure devotee. 1] O born of Moslem parents Haridas! Thy holy acts thy candor plead! Led on thyself for higher ends! For thou wert Vaishnava Haridas! 5] And God is boundless grace to thee, O man! For life eternal, holy, pure! T' enjoy a holy, thrilling glee! Thy ears in vain, Ah, Vaishnava soul! Unknown the wheel of time doth roll!